Every politically sentient American knows that Congress has been dominated by special interests, and many people do not remember a time when Congress legislated in the public interest. 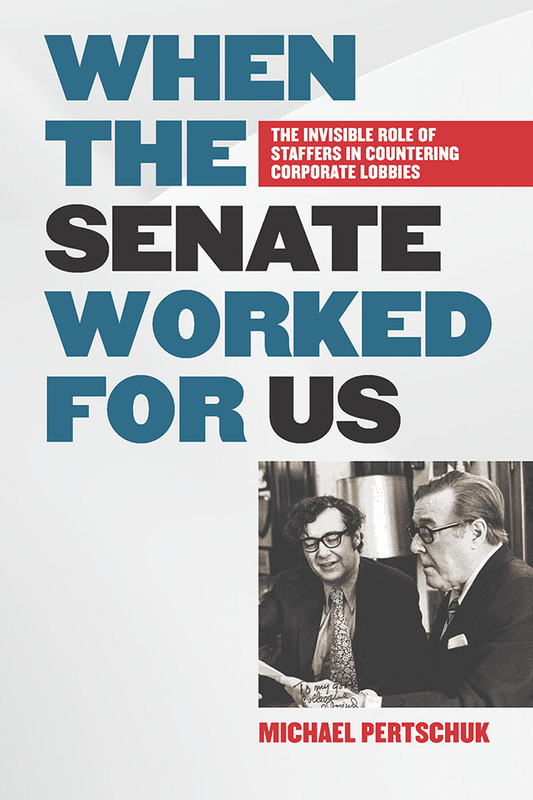 In the 1960s and '70s, however, lobbyists were aggressive but were countered by progressive senators and representatives, as several books have documented. What has remained untold is the major behind-the-scenes contribution of entrepreneurial Congressional staff, who planted the seeds of public interest bills in their bosses' minds and maneuvered to counteract the influence of lobbyists to pass laws in consumer protection, public health, and other policy arenas crying out for effective government regulation. They infuriated Nixon's advisor, John Ehrlichman, who called them "bumblebees," a name they wore as a badge of honor. For his insider account, Pertschuk draws on many interviews, as well as his fifteen years serving on the staff of the Senate Commerce Committee that Senator Warren Magnuson chaired and as the committee's Democratic Staff Director. That committee became, in Ralph Nader's words, "the Grand Central Station for consumer protection advocates." Michael Pertschuk served as chairman of the Federal Trade Commission from 1977 to 1981, and he cofounded the Advocacy Institute. He is the author of Smoke in Their Eyes: Lessons in Movement Leadership from the Tobacco Wars and The DeMarco Factor: Transforming Public Will into Political Power (both published by Vanderbilt University Press) and three other books. "Michael Pertschuk was a master strategist on Capitol Hill--putting into place some of the nation's most important consumer regulations. He's also a master storyteller--with a great gift for letting readers in on what actually happened and how. A wonderful read." "When I first came to Congress in 1969, to work on the Hill and write a PhD dissertation (on congressional staffs! ), I quickly became aware of the reputations of senators who qualified as giants (we called them whales). Warren Magnuson was one. Mike Pertschuk was the first name on the lips of almost every insider when it came to the handful of Senate staffers who also were admired, revered--or detested--for the extraordinary role they played in shaping and passing key policies. The period from the mid-1960s to the late 1970s was a golden age in the Senate when it came to implementing the modern regulatory framework, in the environment, energy, and transportation realms, along with every other area of economic life in America. We have a lot of books giving us the history, some by Mike Pertschuk. But in this book, he adds an important dimension, the key role of the staff, in a witty and penetrating fashion. There is no bragging here, but the insights of someone retired from the fray, informing and perhaps energizing a new group of young, bright Americans to create their own policy advances by restoring the Senate to its rightful functional role." "Mike Pertschuk has written a lively and thought-provoking book about our democracy from an insider's perspective. He is a widely respected former Senate committee staff director who has captured the way Congress worked during a time when it was a civilized and functioning institution. His detailed and often humorous stories about the Senate offer wisdom and in-depth lessons for our current polarized and dysfunctional Congress." "This may be the most important political book written about our current political dysfunction because it lays bare a hidden truth. Mike Pertschuk describes an era when young, idealistic people came to Congress, learned its intricacies, became experts in their field, became trusted friends with members of the opposite persuasion, and were motivated by their desire to solve big problems. It is what kept the special interest lobbyists in check and Congress dedicated to the common good. It is not the case today." "This book is the story of a public servant--Mike Pertschuk--and his fellow activist staffers, whose valiant work on consumer protection have helped millions of Americans. As a major opponent of the tobacco industry year after year, Pertschuk has been advocate, publicist, datalyst, strategist, and exporter abroad of the drive to curb pernicious promotion by the cigarette companies and alert smokers to the dangers and ways out of the habit. His crusade against the tobacco industry--done with more wit and humor than is the custom in Washington--was just a warm-up. In 1964 he became a staff counsel to Senator Warren Magnuson (D-WA), the powerful chairman of the Senate Commerce Committee. There, over the next decade, Pertschuk became the point man for a wave of consumer protection legislation such as this country has never before witnessed. From auto safety to pipeline safety to flammable fabric prevention to radiation safeguards to consumer product safety--to list a few initiatives--Pertschuk persuaded members of the Senate Committee and their staff of their worth. What started in that committee usually ended as national law. Often observing this process firsthand, I admired the diplomatic, conciliatory, but determined way he went about his rounds on Capitol Hill and kept a respectful but ready-to-pounce press accurately informed while making headlines for his Senators, not himself. Investigatory hearings on consumer health and safety and economic abuses by corporations were prepared by Pertschuk and his dedicated staff with precision. Witnesses made news; hearings were turned into printed volumes that provided a bedrock literature that nourished the escalation of higher expectations and demands of business sellers by the buying public. Corporate lobbyists tried everything short of bribery to stop him. They went to his Senators; they went to him; they tried to be tough, to be friendly, to be reasonable, to be intellectual, and to play the underdog. He listened, reasoned, negotiated, and heard them out. But their calculations and contrivances did not work."